JPIC staff and summer fellow Fr Stephen Ashoki OMI (Sri Lanka) attended Hearings in the US Congress on Peru and Bangladesh. Both countries have a strong Oblate presence. “This is a matter of grave concern, not just to the citizens and residents of La Oroya and of Peru, but of the world and, in particular, the United States,” – Testimony to U.S. Congress by Archbishop Pedro Barreto of Huancayo, Peru. This week, on July 19, the House of Representatives Committee on Foreign Affairs held a hearing on the mining contamination by Renco Group, a U.S. based company, which is operating in La Oroya, Peru. The hearing was entitled “Poison Harvest: Deadly U.S. Mine Pollution in Peru.” Those invited to testify included Archbishop Pedro Barreto of the Archdiocese of Huancayo, Peru and Rosa Amaro, President of the Movement for the Health of La Oroya. Also giving testimony were Dr. Fernando Serrano from St. Louis University School of Public Health and Keith Slack representing Oxfam America. The hearing focused on the environmental damage in small town of La Oroya by Doe Run Peru, with testimonies from local community leaders, faith leader and NGOs. Doe Run is the Latin American affiliate of the Renco. Doe Run Peru is accused of being responsible for the health problems of the people in La Oroya especially children suffering from severe lead poisoning, and the environmental contamination affecting the area. Members of Congress strongly condemned Doe Run Peru for the environmental damage and promised to bring up the issue through the United States and Peruvian Free Trade Agreement (FTA) engagement. In addition to these solidarity actions, the JPIC office also attended a meeting at the Embassy of Peru with the Ambassador about human rights issues. In the light of the state violence against indigenous peoples protesting various mining operations in Peru, the JPIC office has signed onto NGO letters calling for respect of human rights in that country. Earlier in the day another important congressional briefing was held focusing on the Human Rights Situation in Bangladesh. The United States is the largest investor in Bangladesh. However, there is an alarming human rights situation, with a number of recent extrajudicial killings and threats to labor activists. 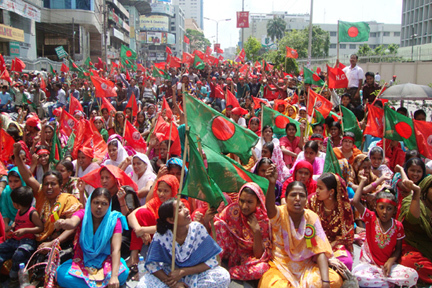 Leading international labor and Human Rights organizations are urging the United States government to use its influence to raise these concerns with the Government of Bangladesh. Those who perpetuate this violence, particularly certain national security operations, must be brought to justice. Since January 2012, Bangladesh has seen 34 victims of extrajudicial killings; the most recent being the killing of Bangladeshi labor leader Aminul Islam. Other issues raised during the hearing include the status for the millions of Burmese Refugees in Bangladesh, child labor in the garment industry, and unsafe working conditions in general. The U.S Government was also challenged to support Bangladesh civil society.